In this podcast I proudly discuss my newest project, which is my 2nd book. I give insider info on the book and share how you can buy books in bulk and get some amazing bonuses! Listen to learn more! Play the episode by clicking below. Or subscribe to the free podcast in iTunes today! Well hello and welcome to Episode Number 37 of the podcast, I am your host Jenn Grace, and here we are today in July. If you are a long time listener of this show, hopefully you went through one of the 30 interviews that was in the month of June. I recorded those interviews back in 2013 but in order to celebrate Pride again I figured I’d bring them back out and have you listen to them all over again in 2014. I hope you enjoyed them. I can tell based on my statistics of my podcast listeners that you certainly were enjoying them so I’m pretty excited about that. I’m really excited to share that I have surpassed 5,000 downloads which is pretty exciting, I’ve been on the air since January of 2013, so I’m going on a little over a year and a half now and I’m quite pleased with the listeners that I have so I really thank you so much for tuning into my show every other week. In today’s episode I want to cover a handful of things and the meat of the show is going to be around when I am talking about my book. The new book is launching in the month of July, 2014 and if you recall, or maybe you don’t recall, but I launched a print book last July as well. I was actually trying to hit the same exact publication date for 2014 as I did in 2013 and I’m just a little bit shy, just a couple of days shy of that. So at any rate I’m really excited about the new book and I want to give you a little bit of a sneak peek into it and talk about what type of special offers I have and all that kind of fun stuff. Really kind of going into what you can expect from this book. So I’m excited to share that with you. And there’s just a handful of things that I kind of want to talk about. I guess this episode is more of- I guess you could say me rambling about just stuff that’s going on in my business and people that I’ve been interacting with as of late. So if you are looking for an episode that has some very specific meaty type of content to it, where I’m talking about a very specific topic or I’m doing an interview, you may want to consider just kind of skipping through this one, pretending it didn’t exist; but I can assure you that the next episode that comes out I will have a guest on. So feel free to just kind of mosey past this one if you’d like and I can check you out in episode 38 which will be in just a couple of weeks. So for those of you still listening who would like to hear me ramble about all the random things that are happening in my business right now, I want to share with you first and foremost how incredibly excited I am about my new website. If you haven’t been to my website recently, or I guess there’s chances that you’ve never actually been to my website at all which is I think pretty interesting. I know that I am a big podcast listener and there are a couple of podcasts that I’ve been listening to for years and I’ve never been to their website. It is quite possible that you have not yet been to my site either, and that’s cool. But with that being said I really want to encourage you to go over there; it’s JennTGrace.com, and just go check things out. It’s really exciting to see what’s going on over there. I had a designer just kind of go in there and just do a complete overhaul of the entire site. So now basically when you go into the site you can actually find things in a much more easy fashion. So on the top I have free resources so everything that I was giving you already for absolutely free, is still there. You can actually just get to it a little bit quicker and then I also have my products laid out really well and services laid out. So I really just want to encourage you to go over there and check it out because it’s super exciting to have a website that just looks as polished as this one does. I wasn’t ashamed of my old one but looking back at it compared to this new one, it is a crazy night and day difference. So please go on over there and check it out. Now one way I can get you to go check out my new website is to encourage you to sign up for my next webinar. I talk about the webinar every single time I do a podcast, and I really just want to find a way to be able to deliver content to you that is timely, that’s going on right now and that’s relevant to your business and your marketing initiatives to the LGBT community. So if you head on over to my website at JennTGrace.com/webinars you can sign up for the next one. There’s bound to be one somewhere while you’re listening to this, somewhere soon. So head on over there and check things out. Let’s see. I don’t think this episode is going to be nearly as long as they usually are because I tend to kind of get on big old tangents and I really like to educate you and just explain as much as I possibly can. But like I said this time around, it’s just kind of giving you an update of things that are happening that are going on and the first thing was really doing the new website. It took not even that long to actually do and I work with an amazing designer and now that is all situated and done, so I’m really excited about that. But the other thing that I really just wanted to spend a little bit of time today talking to you about, is my new book. So if you don’t’ know this already, my new book is called, ‘No Wait, You Do Look Gay,’ and it is the seven mistakes preventing you from selling to the $830 billion LGBT market. So the first book I wrote, which came out last July like I was saying before, was titled, ‘But You Don’t Look Gay.’ So I wanted to kind of do the second book, having it be a little bit of a play off of the first one talking about, you know, ‘No Wait, You Do Look Gay.’ Surprisingly enough, you may think I’m crazy when I say this, I have heard people say that before. 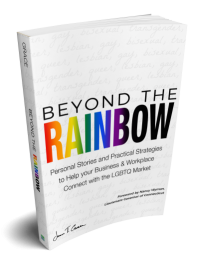 This book is really diving in deep in the communications aspect of the things that you should and should not say in business settings as it relates to the LGBT market. “But You Don’t Look Gay.” The title of my first book..
My first book, ‘But You Don’t Look Gay’ really kind of just scratched the surface in terms of communications faux pas. And Lord knows there are plenty of them out there. So the first book kind of just scratched the surface and now this one, the entire focus of this book is digging deep in those communications faux pas. So if you are listening to this, and you are a professional, a business owner, an entrepreneur, somebody that even works in Corporate America; and you’re listening to this, and you’re thinking, ‘I would really like to know how to communicate with the community,’ or ‘I would really like to know what not to say.’ This book is eighteen chapters filled with that type of information. Which includes some case studies, and really specific examples of how people have really just stuck their foot in their mouth and how it’s kind of affected their business. I want to make sure that this book covers A through Z of all the things that you should now say, and rather than just say, “You shouldn’t say them,” I actually go through and I walk you through on how to phrase them better, or maybe eliminate them entirely. But oftentimes I give you tips and tricks on how to just improve your communications overall. So I want to take a moment and I would love to just read to you the very short snippet on the back cover. And I’d be curious and if you are interested in letting me know your thoughts, I would love to hear them. You can always email me at blog@jenntgrace.com and I will always be there to answer your emails. But I’m always looking for feedback and I want to know how I can improve on this book. So while it may already be going to press, that does not mean that I don’t have room for improvement. I would love to hear from you. So here we go. There you have it. There is my back cover, I’m super excited by the description, I have an amazing editor that I work with; and I’ve already had a couple of people give a rough edit in terms of reading it through and making sure that I wasn’t missing anything and providing some testimonials and all that kind of great stuff. So I already have an awesome testimonial from Mary who is a financial advisor and she says, “You’ll want to read this engaging book more than once to capture all it has to offer. 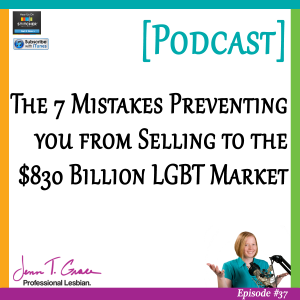 Through her personal insight and professional expertise, Jenn has taken the mystery out of the LGBT market for anyone looking to increase sales. Jenn shows compassion and understanding for the reader while expecting nothing less in return for the LGBT community.” I’m really excited that Mary gave me that testimonial because I feel like it kind of sums up everything that I was trying to do. I want to make sure that in everything that I do, you feel like you can come to me as a judgment free place and environment where you can ask your questions, regardless of how embarrassing they may seem to you, I’m more than happy to take them in and answer them to the best of my abilities without making you feel bad. Because ultimately I’m here to help you grow your marketing outreach and your marketing efforts and of course your sales in your business. So I’m hoping that my book will help you do just that. So there’s my excitement for the book and all that great stuff. And if you are interested in finding out more information about this book, of course you can do it at my main site; but you can also go to www.NoWaitYouDoLookGay.com and you can find out links on what the book’s about, what it includes, where to purchase, all that great stuff. So feel free to head on over there if you want more information. Here is a call to action to you, my faithful listeners. I know that you are really loyal because you allow me into your car, the gym, your life, wherever I happen to be, for an hour every two weeks; and usually these episodes are about an hour, today will be much shorter than that. But I know that you have to dedicate time to listen to this podcast so I want to throw out some things to you that I’m really trying to keep between my listeners and the people who are on my email list. So I would love to have you review my book. And now, I’m more than happy to provide you a free copy of the book, no questions asked, other than I would love for you to write an honest review. I’m not saying just because you’re a listener and you happen to be following me that I want you to write up some fake review, even if you don’t like the book. I legitimately want a real honest review. So you can head on to Amazon and my book is available there. I will have a couple of days of a free promotion through Amazon Kindle, where I can give the book away for free. And I would love for you to take advantage of that and then be able to write an honest review; because the more reviews I have on Amazon, the higher I will rank and the easier it will be for other people like yourself to be able to find the book. So I would love for you to do that. Additionally, if you want to just send me an email – make it really simple – to blog@jenntgrace.com and just use the subject line ‘I want to review your book’ or ‘Book Review’ or something to that nature so I’ll understand that that’s what the email is about. I’m more than happy to send you the electronic copy and then you can go on Amazon, write up a review for it, and if you do that, please just shoot me a note saying that you actually went on Amazon, wrote the review, let me know your address and I will mail you an actual physical copy. So actually I don’t even have the physical copies in my hand yet, I should be getting them on Tuesday. So whenever you happen to be listening to this, the offer still stands. If you want to write a review, shoot me a message with your physical address, I will happily send you a free copy of the book. Just as a thank you for taking the time to read it and then of course taking the time to write the review. This is, like I said, a short episode today. There’s one other thing in relation to the book that I want to talk about and then I will actually give you kind of some teasers about more of the content of the book. But I’m trying something new this time around. The first book that I put out, I relied on Amazon, my website, to help me get it out into your hands and all that great stuff. But one of the things I’m trying to do this time around is to put together packages. So essentially what I want to do is reward you for buying books in bulk. Because I have had multiple requests come in where somebody says, ‘Hey I’m teaching a class on consumer behavior. And your book talks about LGBT behavior. Can I buy 25 of them for my class?’ And I want to be able to say, “Yes, of course you can buy 25 and in addition to buying the 25 I’m going to give you extra things, and I’m going give you some extra access to stuff.’ That’s what I’m doing this time. In the past if somebody says they want to buy 25 books I would just say, ‘Go to Amazon and purchase 25,’ but this time around we can work it a little bit better where you actually get a pretty good deal in my opinion. The first package, there’s a handful and some of them are crazy. But you know they might apply to you, they might apply to someone else, but if you buy five of my books and you can buy them directly through Amazon and you can forward me your Amazon receipt to bookdeal@jenntgrace.com, and of course include your mailing address because I will send you a signed copy of the first book, ‘But You Don’t Look Gay.’ And that’s just for purchasing five of the new books, I’m happy to send you a personalized copy of the first one that I wrote, easy breezy. And you can either contact me to purchase the books or go through Amazon; whichever way is easier. I’m in the process now of setting up my website so that way it handles being able to take in these bulk orders. So the second one is if you buy ten books you’ll get the personalized copy of the first one, but then there’s also a bonus video that I want to provide you, and it has a worksheet that goes with it. This video is how to estimate your potential market size using available data to determine the LGBT market potential in your geographic area. Now this is actually a bonus video that goes with my full training course, that I don’t have available for sale anywhere else; so it’s just me taking the bonus out of my course, which is a $997 value and allowing you to have it just for buying ten books. So you get the ten books, give them away as gifts, give them away to colleagues; and then you also get access to this cool bonus video. It’s about- I don’t think it’s quite an hour long, it’s a little bit less than an hour. But it really just goes into great detail on how to actually figure out what the market potential is in your area. So you know, you might be in a really rural area where the market potential for LGBT outreach might not be there, and it might not be a really good use of your marketing budget or your resources; I help you identify that. And the third deal is if you buy 25 books, so now we’re getting into an area where I think a lot of people would buy 25 books, and then I have a couple of crazier ones below. But if you buy 25 books I will give you six months access to my online training course, the one that I was just mentioning. And the course is called, ‘How to Authentically Market to the Gay Community,’ and it includes ten step-by-step modules to help you prepare the best communications and marketing outreach plan for the community. So the book itself really covers the communications, and the course really helps you actually put together a plan. 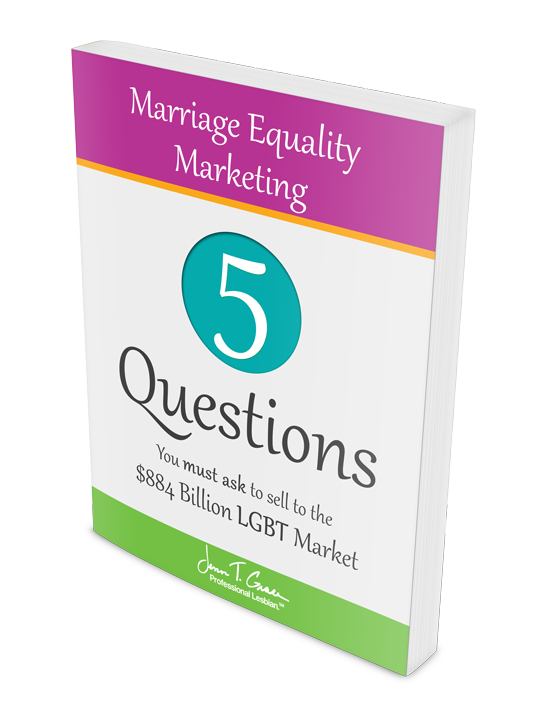 So by the time you are done with the course you will be able to identify an LGBT marketing plan, all for yourself. So that’s pretty exciting and that’s a $997 value and you get access to it for six months. So please consider that if you’re thinking about folks who might need the book, or if you’re teaching a class, or even if you want to give it to your marketing department for a gift. There’s a lot of different ways that you can take advantage of buying some books in bulk and then of course getting the course as well. Now the next one is buying 50 books, and that will give you twelve months access to the online training course. So it’s the same course, you just get double the time to spend with it and you know, depending on how fast of a learner you are, you can do it in a couple of months; you could actually space it out to one module, or one piece of the training every month and that could take you up to ten months. So it depends on how you want to operate. I’m kind of the quick and dirty, let’s get in, let’s get ‘er and get going. I know a lot of other people are more slow and steady. So buying 50 books gives you the opportunity to go slow and steady. And now if you buy 100 books, you get everything else that’s been talked about; so you get the bonus video, you get the twelve months access to the course, you get the signed copy and you get the worksheets that go with that bonus video. But what I will do is I will do a live 60 minute virtual webinar for just your audience. So this isn’t one of my traditional webinars where I invite the world to come attend, this is just for your audience and you give me a little bit of background about who your audience is, so maybe you are realtors, maybe you’re financial advisors, whatever your particular profession might be. If you let me know what that is, I will make sure that I tailor the content of this 60 minute virtual webinar to your specific audience. 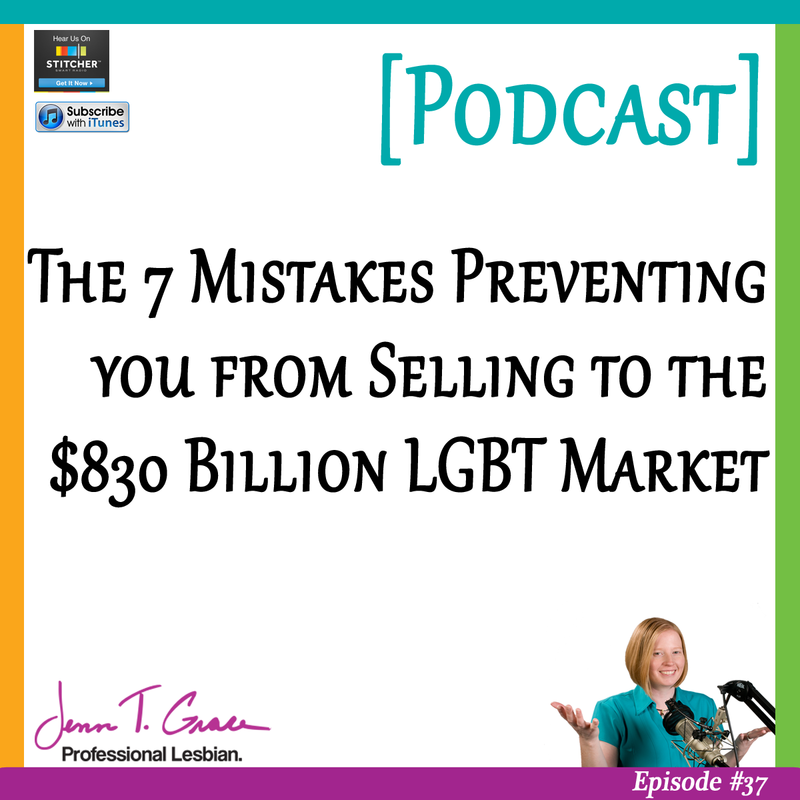 And we can go into great detail on the seven mistakes preventing you from selling to the $830 billion LGBT market. So essentially all of the questions that might arise while you’re reading the book, we can go through during this private one-on-one or one-on-however many people you have available live virtual webinar. So that’s pretty cool, and that’s if you buy 100 books. Now we’re getting to crazy land because I don’t know that anyone would buy 500 books, but I will throw it out there anyway. And if you do buy 500 books I will do the live 60 minute virtual training, you know just because that’s part with the 100 books. 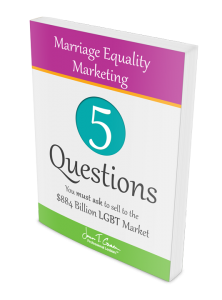 And then of course the access to my course and then so it just keeps going on and on and on; but with the 500 books I will do a three months of private one-on-one coaching to help you improve your LGBT marketing efforts. So just me and you, sitting down together, one session a month private for three months to coach you along the way in terms of making sure that your LGBT marketing efforts are really strong and really solid and the best that they can absolutely be. So that’s me basically holding your hand through the entire process. And that is with 500 books. And then here we are with the crème de la crème of craziness; if you buy 1,000 books. Maybe you’re a conference organizer and maybe you have a ton of travel agents coming to a conference and you want to have an item to give away. So you can give away my book because this is perfect for the travel industry as it is for many, many other industries. But say you want to buy 1,000 books. I will do everything included, the three months private coaching with the two of us, the live virtual webinar. But in addition I will come and do an in-person training with you with however many people you happen to have, I of course have ideas on how big of an audience is good for having a training. I can actually turn that training into some kind of keynote presentation, whatever you’re really looking for and the content can be around specifically what’s in the book, or it could be stuff that is from the first book, we can really work together to figure out what would work best for your audience. That’s if you bought 1,000 books. And this is really pretty applicable for US audiences only. I’d be more than happy to travel much further, however we would have to talk about how to get me there and all that great stuff. But I know that I do have a really broad and diverse listener base so it’s quite feasible that somebody from outside of the United States would be buying 1,000 books. So actually, let me go back to that for a moment and talk about the podcast stats; I’m just going to go rogue for a moment in terms of where there are listeners. So if you listened, I think it was Episode- back in May probably, where I was talking about my excitement for where people are listening to. And three states are the top three spots which are California, New York and Connecticut. And then China, Beijing specifically, is where my fourth largest listener base is. It baffled me then and it still a little bit baffles me now. But it’s really exciting that I have listeners in China, and a lot of them. But additionally, there are 47 other countries who are listening to this show, and I think that’s really frickin’ cool. I’m really excited about that. We have countries ranging from basically all across the globe from Australia to Zambia; so there’s 47 countries that are listening to this show which is pretty cool. And now here’s maybe a call to action to you, who knows. I have three states in the United States where I have zero listeners. Just three; which I think is pretty cool because that’s 47 states who are listening. And that is Montana, Idaho and Mississippi. So those three states are just kind of floating out there where I have no listeners. I so badly want to be traveling to Mississippi or Idaho or Montana; none of which are on my current travel agenda. Just to be able to download my own episode in that state. Just to say that there’s a listener there. So save me from having to drive to one of those three states and tell a friend who happens to live in one of those states that you want them to listen to the show; because why not? Alright, I’ve been rambling on and on but there are my book packages. I really hope that you take a moment to check them out. You can actually see these book packages on my website if you go to JennTGrace.com/book-packages. So go there, you can see all of this in person, you can order some books, you can get in touch with me; whatever you feel like doing. But I’m really excited about these book packages and I’m hoping that they go better. I’m really hoping that these help, really just get more sales. Not for me to make more money necessarily, but to really educate you. Like at the end of the day my main purpose for doing this show specifically, is to provide you with the most free content I possibly can because you deserve it, and I love talking with you, I love talking with people like you, having guests on my show and just sharing as much information as I possibly can. Breaking down the book a little more.. So now that I’ve been promoting the hell out of the book, I figured now is not a bad time to just kind of tell you a little bit more about what’s in the book. So the book itself is broken out into three parts. And the first part is the ‘What you should know before starting.’ Really breaking down some really big stereotypes like the LGBT community being monolithic. And then we talk a little bit about authenticity and transparency and why you have to have both of those in your marketing efforts. And then we talk about inclusion based marketing, what that actually means for your business as it relates to marketing to the community. And then I have a couple of what I’m calling bonus vignettes, I just thought it sounded fun so I called them vignettes. And the one in this first part is how to market to lesbians. I know for a fact that marketing to lesbians is something many of you are interested in and I get phone calls, I get emails, I get Facebook messages from people all the time asking, ‘How do I find where the lesbians are?’ And this bonus pull-out of this book I attempt to address that question. We shall see what your thoughts are and if you have success in what I teach you. Then there’s talking about are you an ally, are you an advocate, are you neither, do you not know what either of those things mean; and then I go into detail and explain how to identify what you consider yourself to be. And then there’s the LGBT community by numbers, which is really just talking about the demographics of the LGBT community and the type of efforts and the results that you can expect to see. Then we get into the really meaty stuff and talking about what you’re ‘why’ is. Why you want to market to the community. This is something that I’ve talked about in great length on the podcast before. So this should be no surprise that it’s included in my book. And then we hop on over to those pesky little seven mistakes and that’s where part two begins; where we really dive deep into the seven mistakes that are preventing you from selling to the community. And those seven mistakes, I will tell you what the mistakes are but I will not tell you what they really are. So I will tell you that the first one is assumptions, and there’s a lot of them; and I cover the highlights. And then there’s stereotypes, and then there’s inappropriate questions. There’s mannerisms, insinuations, implications, assertion. So there’s the seven, those are the seven big ones. Mind you there are probably 100 other type of mistakes but I focus on each of these areas and then I provide a whole host of mistakes that happen when you are making insinuations with people. That is what’s included in part two and then part three is really just kind of giving you a glossary, giving you some advance terminology, kind of condensing all of what’s in the book into one area where you can just look up all the links because I include, I think it’s something like 68 different links to different sources of information as it relates to the LGBT community. So I have it all in one spot so it makes it just really easy for you to find. That I think is going to wrap up today’s episode. I don’t know if you can hear or tell that I am losing my voice or if it’s much scratchier than usual but it is indeed July and I am sick. And I don’t really know how this keeps happening, but for some reason I end up sick in the summer and it’s just- it’s not pleasant. So I am muddling through it and trying to get this episode recorded before my voice is gone completely. But it is indeed July 10th that you are listening to this episode so I’m really hoping that I will see you at the end of this month in Las Vegas for the NGLCC Conference. I have talked about the conference before many times on this episode, I’ve had many people who work for the NGLCC, or have some sort of affiliation with them, and I’m going to be in Las Vegas from I believe it’s July 27th-August 2nd. Those are my travel dates which happen to be a couple days before and after the conference. But the conference is right during that week. So if you’re going to be there please, please please email me; I would love to meet you in person if we haven’t already met. And the conference is amazing, I say this all the time that it’s kind of like a family reunion for me, it’s more about just seeing everyone I know that I do a lot of business with throughout the year and just seeing everybody in one place. So it’s really exciting and I hope I can meet you there if you are attending; so please let me know and we will make arrangements. So yeah, that’s all I’ve got for today. I, as always, really appreciate you being a loyal listener and hopefully I will see you at the end of this month. If not, come back and I will talk with you in the next episode where I have another awesome guest. Alright, cool. I will talk to you soon. Thanks so much, bye bye. Check out all of the book packages mentioned in the episode and buy in bulk!  Will you be in Las Vegas at the end of the month for the NGLCC Conference? If so, let me know – I’d love to hang out with you!